Dutch Pro Multi Total is a root booster enzyme treatment to super propel root system growth and strength. Dutch Pro Multi Total uses enzymes to break down rotted roots into usable nutrients for the plant, soil and increases water retention. 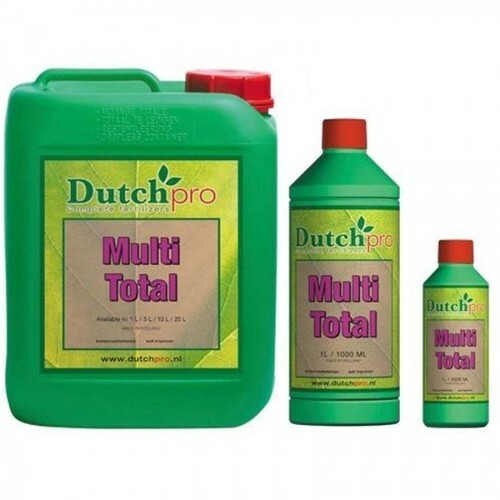 Dutch Pro Multi Total reduces root rot, increases mineral and micro nutrient uptake and protects from stress. It promotes healthy microbes in all grow mediums like clay, soil and water to develop the most abundant producing plants that have crops with the highest quality potency, health and strength. The best time to use Dutch Pro Multi Total is when you have first potted the plant in your hydro system or nutrients grow medium. For potted plants that are watered by hand, applying every 2 weeks is the best practice. For hydroponic application Dutch Pro Multi Total should be added every 2 weeks during every nutrient solution change directly into the reservoir. Dutch Pro Multi Total gives root structures optimal health and strength which in turn increases mineral and nutrient uptake to the plant.